Why your approach to problem solving is wrong? 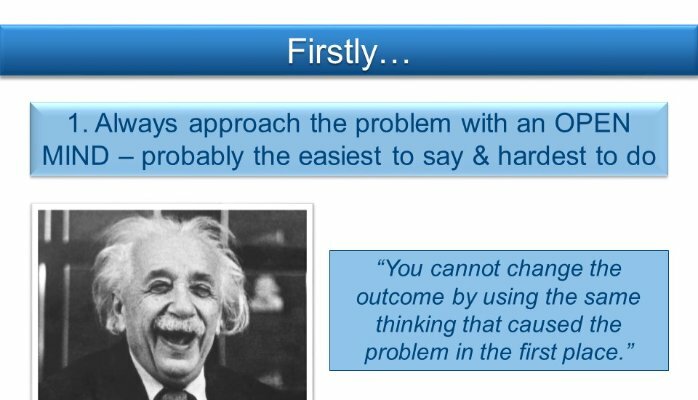 Comments: Comments Off on Why your approach to problem solving is wrong? Comments Off on Why your approach to problem solving is wrong? I had the honour of working with a team today developing their problem solving skills. Of all the material we discussed and all the techniques we tried the issue in the room always came back to our own experience, which is why we say, “you can not change the outcome by using the same thinking that got you there in the first place”. This does not mean we all resign, this means we need to listen better. A fresh pair of eyes in a project team, a new recruit to a business. The issue is the same, they can see our flaws and opportunities but their desire to fit in conflicts with our need to think widely about the problem. As leaders we need to hold up the mirror we need to ask, “what do I contribute? How do I stifle my teams ability to problem solve?” The techniques have been around forever and yet we still struggle with time and resource to implement the solution all this leads to the same conclusion. As leaders we need to create a learning culture. This is the only way in which we will resolve our issues to the root cause, we can fix things but this only delivers a culture of firefighters and things will continue to go wrong. As a leader how can you develop a learning culture? You must give your team the freedom to make mistakes, the freedom to say ‘I got it wrong but I learnt’. As leaders we are the only ones who can challenge the way things are done.